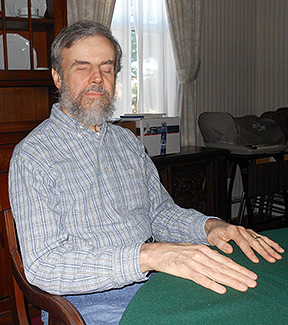 The National Federation of the Blind of West Virginia got a new member in 1969—Edgar McDonald. What they didn't know at the time was that they had gained a loyal member who would bring about great change over the next forty four years. It is McDonald's hard work and dedication that recently earned him an induction into the National Federation of the Blind's Hall of Honors. McDonald says the induction meant a lot to him because it is people he has worked with and been friends with over the years who voted him in. "The fact that they think enough of me to vote for me means a lot; it's significant," he said. McDonald says it has meant a great deal to him to be involved in the organization. "I learned about being blind as a political issue rather than a medical one," he said. McDonald said that he has tried to change social "barriers" and the public's view on the blind. "I came to understand that by talking to other blind people and working collectively, you get more done." Getting more done is exactly what McDonald has done in his years of service to the organization. McDonald served as president of the West Virginia affiliate from 1991 to 2002. Under his leadership NEWSLINE for the Blind® was brought to West Virginia with the addition of the Huntington Herald Dispatch. McDonald was also a driving force in getting the Braille Bill pushed through the West Virginia Legislature and signed into law. McDonald also had the distinction of serving on the national board of the National Federation of the Blind from 1994 to 1997. He currently serves as chairperson of the Agency Partnership Committee and is also serving as the first vice president of the National Federation of the Blind of West Virginia and as president of the Members-at-Large Chapter. "It's humbling in a way," says McDonald. "But now that I got that to live up to, if I don't step it up they might kick me out," he laughs. McDonald's nomination said he was an integral and essential part of the Federation family and most deserving of the honor for changing what it means to be blind. For McDonald, that is just a part of everyday life. "I try to live my life in a way that says I am blind and still out living my life. Being blind is a part of my life, a big part," says McDonald, "but I am not a blind guy, I am a guy who happens to be blind."